FlexiSPY is a reliable spy software for the iPhone and iPad. Their industry track record shows they keep up with the current tech trends. They tailor their software updates to support the newest technologies and applications evolving in the fast growing tech world. FlexiSPY is the forerunner when it comes to supporting the latest devices and operating systems. Nearly every other spy software is trying to catch up to them. They consistently move forward and, for all they offer, they aren’t the most expensive either. However, neither are they the cheapest. You do get what you pay for, after all, and sometimes the cheapest things aren’t always the best, but neither are the most expensive things usually worth the cost. FlexiSPY is right in the middle. Any Android phones, having Android OS versions up to 6.0 (Marshmallow). Apple iPhone up to versions 9.1, which includes iPhone 6s Plus. BlackBerry up to versions 7.1. Whenever a new operating system is released, they are the first to support the devices. This way you’ll be sure you’ll always be able to monitor the latest and greatest devices and operating systems. The basic features, for most spying apps, are nearly the same across any device or operating system. The spying capabilities usually remain the same when it comes to basic features. 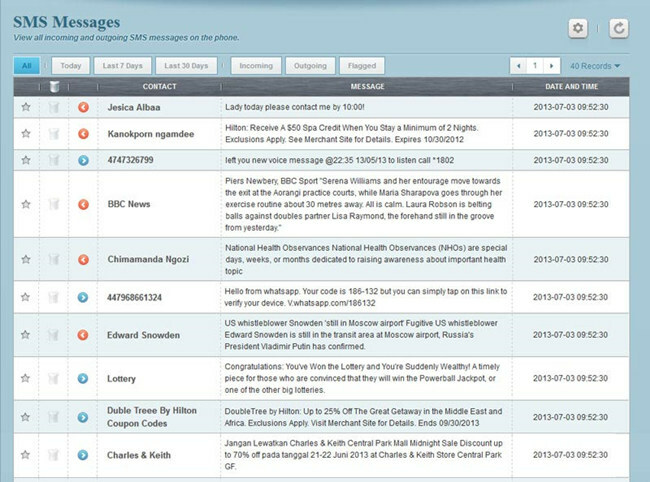 Features such as logging text messages, logging the sender and recipient of calls sent and received and being able to locate the device by using the target device’s GPS. Other features may include email monitoring and logging web sites visited. You can even make a backup of all the files located on the target device. What sets FlexiSPY apart from the rest is its advanced feature catalogue. One of which is the call recording feature. If you need this specific feature, you’ll find very few spying programs, if any, offer it. FlexiSPY gives you the capability to record a user’s call and download it to a PC, so you can listen to it later. Download call recording clips or listen directly from the FlexiSPY dashboard. Some other acclaimed features are its ability to monitor the messages in WhatsApp. WhatsApp is a messaging service and application for Android devices, iPhone and iPad. BlackBerry messenger can also be spied on, as well. Another great feature is monitoring all Gmail accounts. On most other spy software, you can only monitor the primary account, whereas FlexiSPY monitors all of them. You can also set trigger words. If you do this, you will be alerted each time a specified word is used. Lock and unlock target device remotely. Remotely wipe data, which is especially good for businesses. Spy on messaging and call apps such as Skype and Viber. Geo Fencing allows you to specify a safe area. If the target device goes outside of the safe zone, an alert is sent by text, email or both. 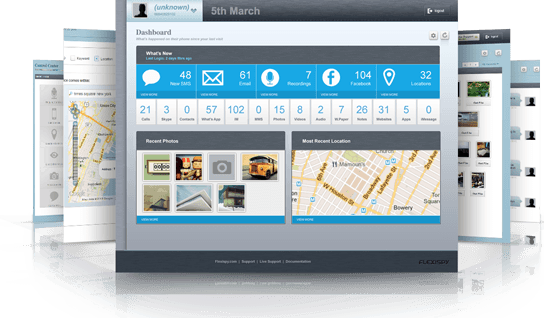 FlexiSPY is hard to beat in terms of the features it offers. The advanced catalogue they have is what sets them apart. They also don’t require you to be tech savvy, and if you want to trial the software, they have a demo account where you can see how it works. In the end, the decision is yours. Whether you want your dollar to be well spent is your choice. Just your luck that FlexiSPY makes choosing easy for you. However, you should find out for yourself. Taking a look at their demo is certainly something you should consider. You’ll want to see if for yourself when it comes to the spy software that’ll surpass all the rest.